Rajinder Nagar Folks, Have You Had This Turkish Ice Cream In Upside Down Cones? No one loves gimmicks as much as Delhiites do, and one that we still haven’t stopped obsessing over is the inverted Turkish ice cream that first made its way to Noida. Good news: It’s now Rajinder Nagar’s turn to treat its inhabitants to gravity-defying, creamy scoops of ice cream via Twisting Scoops. Having been around for six months or so, Twisting Scoops even made its first food fest appearance at the Chandigarh leg of Grub Fest. The folks obviously believe in keeping abreast with the fads with their introduction of black ice cream in an amazing tiramisu flavour, and a certain virgin mojito that has made it to their bestsellers list. Armed with some real tricks up their sleeves, these ice cream jugglers make eating a scoop nothing short of a theatrical performance. If you haven’t yet seen videos of baffled baby faces and hangry folks at these ice cream kiosks, you’ve totally missed out on a cool gimmick. One of their star performers is the three scoop wonder with coffee, bubblegum and blueberry piled on top of each other. Their Belgian Chocolate is thick, indulgent and super-satisfying as well. In fact, you can choose your toppings with swirls, sprinkles, syrups and the likes for special effects. 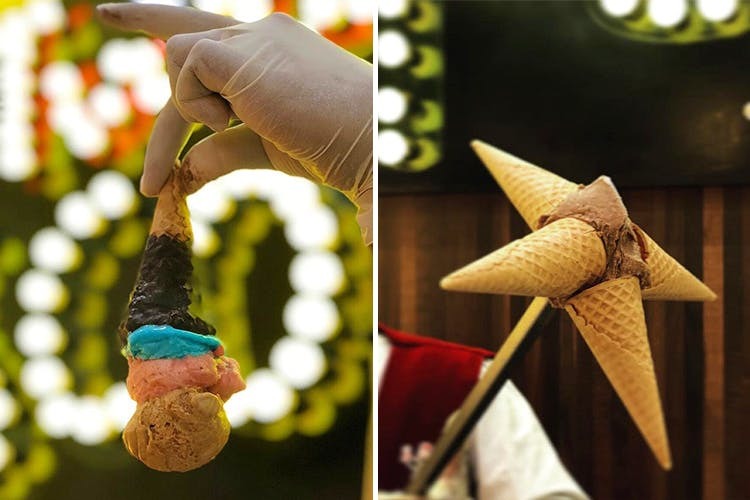 If you hold up your ice cream against the soft glow of their rope lights, you can Instagram the hell outta that cone. Just saying. When you’ve tried their ice cream, try their shakes, maybe? Turkish Coffee and Salty Caramel, we’ve got our eyes on you guys.